The HD 280 Pro Circumaural Closed-Back Monitor Headphones from Sennheiser feature a collapsible design with swiveling earcups and extended low end reproduction with a frequency response of 8 Hz to 25 kHz. Rejection of outside noise is high, rated up to -32 dB. Efficient neodymium magnets contribute toward an extended dynamic range and high output. The thick, padded leatherette earcups and adjustable padded headband allow for a precise and comfortable fit during extended periods of studio recording and mixing. 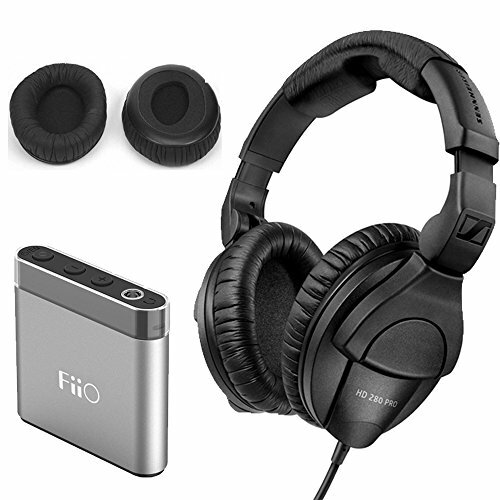 The A1 from FiiO is a portable headphone amplifier with volume control, hi-fidelity output, and four EQ modes providing maximum flexibility. It can be used for smartphones, computers, tablets, iPods, and MP3 players to increase volume and deliver a more satisfying experience when listening to audio. Featuring a sandblasted aluminum-alloy chassis, the portable amp uses a rechargeable lithium-ion polymer battery for power and weighs only 0.7 ounces. The four different EQ modes are switchable by briefly pressing the power button. A blue LED flashes to indicate each mode as it is selected. Furthermore, there is a 3-color status LED to help you monitor the power condition of the unit, which flash differently for power on, charging, low battery, and full battery status. Finally, the tiny size of the A1 portable headphone amplifier makes this a great choice for adding that extra punch to your audio listening experience. Also enjoy an extra pair of Sennheiser H-85733 - soft leatherette replacement ear cushions for the HD280 Pro studio headphones.